For the Phoenician Heliopolis, see Temple of Jupiter (Roman Heliopolis). Heliopolis is the latinized form of the Greek name Hēlioúpolis (Ἡλιούπολις), meaning "City of the Sun". Helios, the personified and deified form of the sun, was identified by the Greeks with the native Egyptian gods Ra and Atum, whose principal cult was located in the city. Its native name was I͗wnw ("The Pillars"), whose exact pronunciation is uncertain because ancient Egyptian recorded only consonantal values. Its traditional Egyptological transcription is Iunu but it appears in biblical Hebrew as Ôn (אן) and Āwen (און), leading some scholars to reconstruct its pronunciation as *Āwanu. Variant transcriptions include Awnu and Annu. The city also appears in the Old Kingdom Pyramid Texts as the "House of Ra". 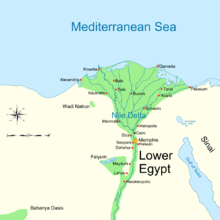 In ancient Egypt, Heliopolis was a regional center from predynastic times. It was principally notable as the cult center of the sun god Atum, who came to be identified with Ra and then Horus. The primary temple of the city was known as the Great House (Ancient Egyptian: Pr Ꜥꜣt or Per Aat, *Par ʻĀʼat) or House of Atum (Pr I͗tmw or Per Atum, *Par-ʼAtāma; Hebrew: פתם‎, Pithom). Its priests maintained that Atum or Ra was the first being, rising self-created from the primeval waters. A decline in the importance of Ra's cult during Dynasty V led to the development of the Ennead, a grouping of nine major Egyptian gods which placed the others in subordinate status to Ra–Atum. The high priests of Ra are not as well documented as those of other deities, although the high priests of Dynasty VI (c. 2345 – c. 2181 BC) have been discovered and excavated. During the Amarna Period of Dynasty XVIII, Pharaoh Akhenaten introduced a kind of henotheistic worship of Aten, the deified solar disc. As part of his construction projects, he built a Heliopolitan temple named "Elevating Aten" (Wṯs I͗tn or Wetjes Atum), whose stones can still be seen in some of the gates of Cairo's medieval city wall. The cult of the Mnevis bull, another embodiment of the Sun, had its altar here as well. Their personal formal burial ground was situated north of the city. The store-city Pithom is mentioned once in the Hebrew Bible (Exodus 1:11), and according to one theory, this was Heliopolis. The temple of Ra was said to have been, to a special degree, a depository for royal records, and Herodotus states that the priests of Heliopolis were the best informed in matters of history of all the Egyptians. Heliopolis flourished as a seat of learning during the Greek period; the schools of philosophy and astronomy are claimed to have been frequented by Orpheus, Homer, Pythagoras, Plato, Solon, and other Greek philosophers. Ichonuphys was lecturing there in 308 BC, and the Greek mathematician Eudoxus, who was one of his pupils, learned from him the true length of the year and month, upon which he formed his octaeterid, or period of 8 years or 99 months. Ptolemy II had Manetho, the chief priest of Heliopolis, collect his history of the ancient kings of Egypt from its archives. The later Ptolemies probably took little interest in their "father" Ra, and Alexandria had eclipsed the learning of Heliopolis; thus with the withdrawal of royal favour Heliopolis quickly dwindled, and the students of native lore deserted it for other temples supported by a wealthy population of pious citizens. By the 1st century BC, in fact, Strabo found the temples deserted, and the town itself almost uninhabited, although priests were still present. Heliopolis was well known to the ancient Greeks and Romans, being noted by most major geographers of the period, including Ptolemy, Herodotus and others, down to the Byzantine geographer Stephanus of Byzantium. In Roman Egypt, Heliopolis belonged to the province Augustamnica, causing it to appear as Heliopolis in Augustamnica when it needed to be distinguished from Baalbek. Its population probably contained a considerable Arabian element. Many of the city's obelisks were removed to adorn more northern cities of the Delta and Rome. Two of these eventually became London's Cleopatra's Needle and its twin in New York's Central Park. During the Middle Ages, the growth of Fustat and Cairo only a few kilometres away caused its ruins to be massively scavenged for building materials, including for their city walls. The site became known as the "Well of the Sun" (Ayn Shams) and ʻArab al-Ḥiṣn. The importance of the solar cult at Heliopolis is reflected in both ancient pagan and current monotheistic beliefs. Egyptian and Greco-Roman mythology held that the bennu or phoenix brought the ashes of its predecessor to the altar of the sun god at Heliopolis each time it was reborn. In the Hebrew's scriptures, Heliopolis is referenced directly and obliquely, usually in reference to its prominent pagan cult. In his prophesies against Egypt, Isaiah claimed the "City of the Sun" (Ir ha Shemesh) would be one of the five Egyptian cities to follow the Lord of Heaven's army and speak Hebrew. [b] Jeremiah and Ezekiel mention the "House of the Sun" (Beth Shemesh) and Ôn, claiming Nebuchadnezzar of Babylon would shatter its obelisks and burn its temple and that its "young men of Folly" (Aven) would "fall by the sword". The "Syrian Heliopolis" Baalbek has been claimed to have gained its solar cult from a priest colony emigrating from Egypt. Heliopolis in Augustamnica remains a titular see of the Roman Catholic Church. The ancient city is currently located about 15–20 meters (49–66 ft) below the streets of the middle- and lower-class suburbs of Al-Matariyyah, Ain Shams, and Tel Al-Hisn in northern Cairo. The area is about 1.5 kilometers (1 mi) west of the modern suburb which bears its name. Some ancient city walls of crude brick can be seen in the fields, a few granite blocks bearing the name of Ramesses II remain, and the position of the great Temple of Ra-Atum is marked by the Al-Masalla obelisk. Archaeologists excavated some of its tombs in 2004. 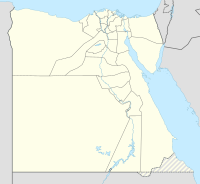 Wikimedia Commons has media related to Heliopolis, Egypt. ^ Variant texts read "City of Destruction" (Ir ha Heres) instead. ^ a b c Dobrowolska; et al. (2006), Heliopolis: Rebirth of the City of the Sun, p. 15, ISBN 9774160088 . ^ Collier & Manley, p. 29. ^ "Model of a Votive Temple Gateway at Heliopolis (49.183)", Official site, Brooklyn Museum, retrieved 8 July 2014 . ^ Hart, George, The Routledge Dictionary of Egyptian Gods and Goddesses, ISBN 0-415-34495-6 . ^ The Historical Library of Diodorus Siculus, Book I, ch VI. ^ Ptolemy, iv. 5. § 54; Herodotus, ii. 3, 7, 59; Strabo, xvii. p. 805; Diodorus, i. 84, v. 57; Arrian, Exp. Alex. iii. 1; Aelian, H. A. vi. 58, xii. 7; Plutarch, Solon. 26, Is. et Osir. 33; Diogenes Laërtius, xviii. 8. § 6; Josephus, Ant. Jud. xiii. 3, C. Apion. i. 26; Cicero, De Natura Deorum iii. 21; Pliny the Elder, v. 9. § 11; Tacitus, Ann. vi. 28; Pomponius Mela, iii. 8. Byzantine geographer Stephanus of Byzantium, s. v. Ἡλίουπόλις. ^ Plin., Nat. Hist., vi, 34 . ^ Macrobius, Saturn., i. 23. ^ "Al-Ahram Weekly | Features | City of the sun". Weekly.ahram.org.eg. 2005-06-01. Archived from the original on 2013-03-25. Retrieved 2013-03-26. ^ "Pharonic tomb uncovered in Cairo, suburbs of Matariya", Egiptomania, 26 August 2004 .